At first glance the hustle and bustle that greets you inside Vancouver Airport south terminal on a summers morning will be all too familiar from similar establishments you’ll find all over the world. Soon, however, you will note the clientele are almost exclusively male, men dressed for a day in the outdoors rather than some city business meeting. Most will have a beaming ear to ear smile, very unusual for such an early hour, and many will be toting slim alloy tubes. A cursory glance at the short row of check in desks will reveal the names and logos of various fishing lodges that you’ll find along the spectacular British Columbian coastline rather than airlines, while a spectacular glass case containing impressive mounts of chinook and coho salmon will be the final clue; welcome to sport fishing central! A bright silver coho caught on our first afternoon. It was here that I, complete with beaming smile and tubes of fishing rods, checked in for the 0730, 350 mile flight north to Bella Bella on the central BC coast. From there a five minute drive took me down to the towns quaint little harbour and a further five minutes aboard a boat took me to ‘Whiskey Cove Lodge’ near Shearwater, base for ‘Central Coastal Adventures’ with whom I’d be fishing for the first three days of my North Pacific adventure. 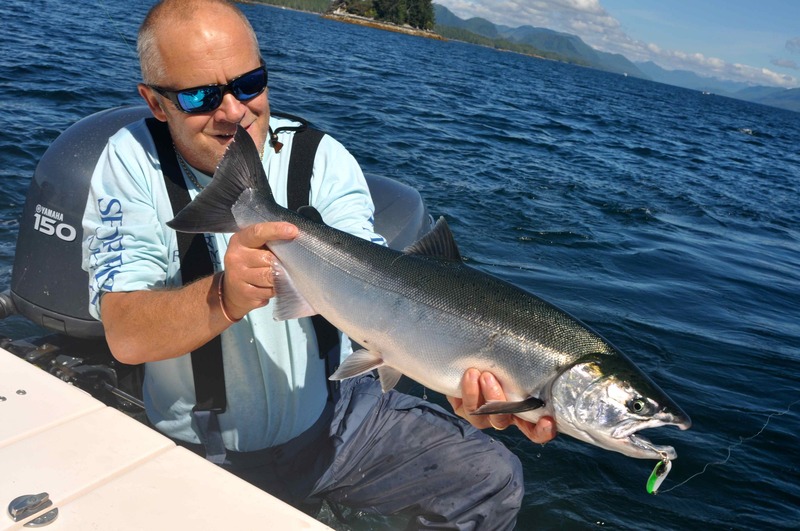 Just hours after touch down I was proudly holding my first coho salmon, a fin perfect, polished pewter example of piscine perfection, one of a dozen similar fish my companions, Doug and Jackie Olander, caught that first glorious afternoon. Trevor holds another perfect coho. Unlike Atlantic salmon the five species of Pacific salmon, chinook, coho, sockeye, pink and chum feed in the sea within close proximity to the coast. Atlantic’s feed thousands of miles offshore near Greenland, and by the time they migrate back to the coast they have long stopped feeding. Those salmon we do occasionally hear about getting caught in the sea around the UK coast are almost certainly escapee’s from fish farms, or sea trout. Downrigger, mooching rod & ‘knuckle duster’ reel. 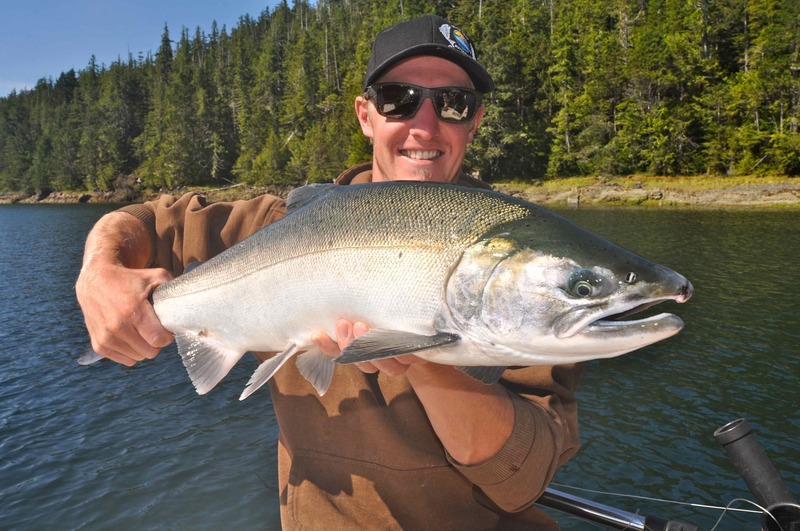 Ranging from northern California right up to Alaska, salmon are the number one species of salt water sports fish for the huge numbers of anglers who fish the Pacific coast of North America, with chinook, or king salmon, and coho, or silver salmon, topping the list. Both species can be caught on various methods, but the technique of choice for most is trolling using either artificial lures or baits fished off downriggers, in conjunction with long, soft mooching rods and reels. 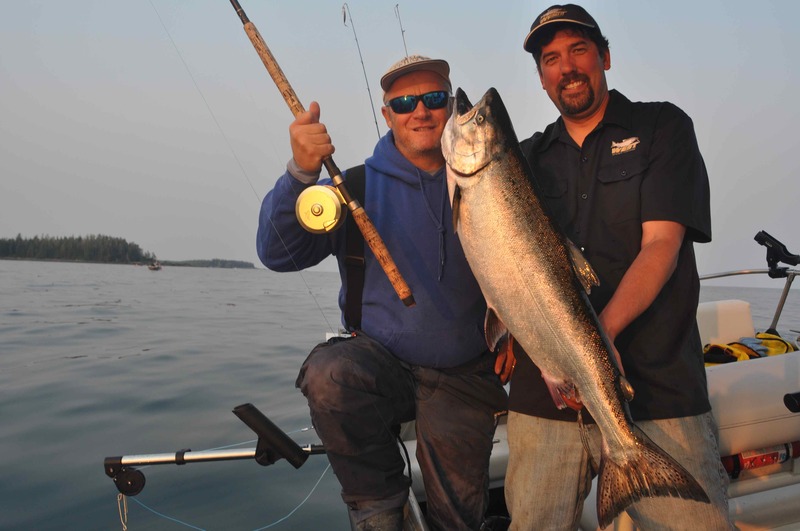 The morning of our first full day we were up before sunrise our skipper, Trevor Gustafson, keen to have baits fishing at first light; prime time for Chinook, especially the much sought 30lb plus trophy fish known as ‘Tyee’, which means ‘Big Chief’ in local First Nation dialect. Trevor took us to a small rocky cove off the south-west shoreline of Hunter Island, a secluded and tranquil place the shoreline thickly fringed with kelp and overhung by tall cedar and spruce trees that cling precariously to the thin patches of soil between the rock. A light mist covered the calmest of seas. 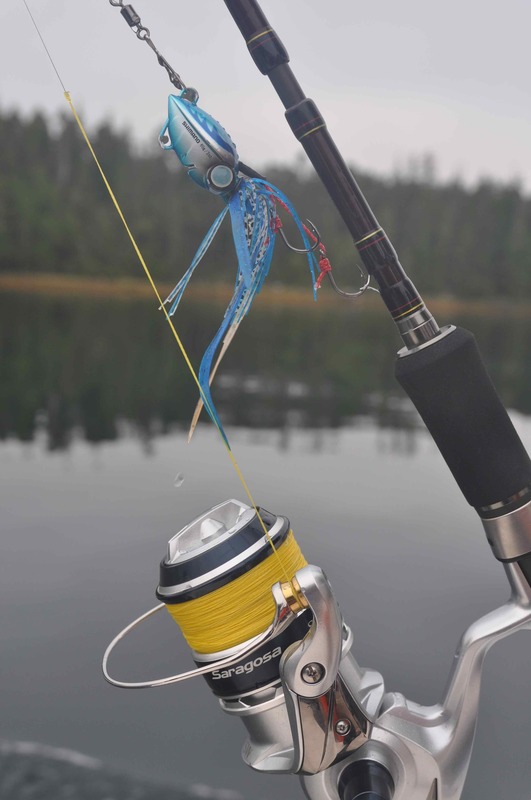 Bait, a slim anchovy, was mounted inside a plastic hood and fished a few feet in front of a colourful oblong flasher or dodger that serves as an attractor. As instructed by Trevor I slowly lowered the downrigger down to 44ft, set the rod in the holder and sat back to wait for a bite. Immediately the tip of the soft rod started bouncing, and naively I assumed this must have been caused by the heavy down rigger ball bouncing off the kelp. “Fish on, grab the rod!”, shouted Trevor instantly snapping me out of an early morning state of caffeine deficient drowsiness. I grabbed the rod, reeled the line tight, then lifted the rod to set the hooks: fish on! Already the previous afternoons fishing had taught me these sea run salmon fight hard and run fast, those 8-12lb coho I had caught the previous afternoon had provided excellent sport each making several long, hard line stripping runs before succumbing to the net, but the first fish I hooked that morning off Hunter Island was in a class of its own though. The first run effortlessly ripped upwards of 50 yards from the reel, the handle spinning in a skin splitting frenzy, these direct drive mooching reels are called ‘knuckle dusters’ for very good reason! 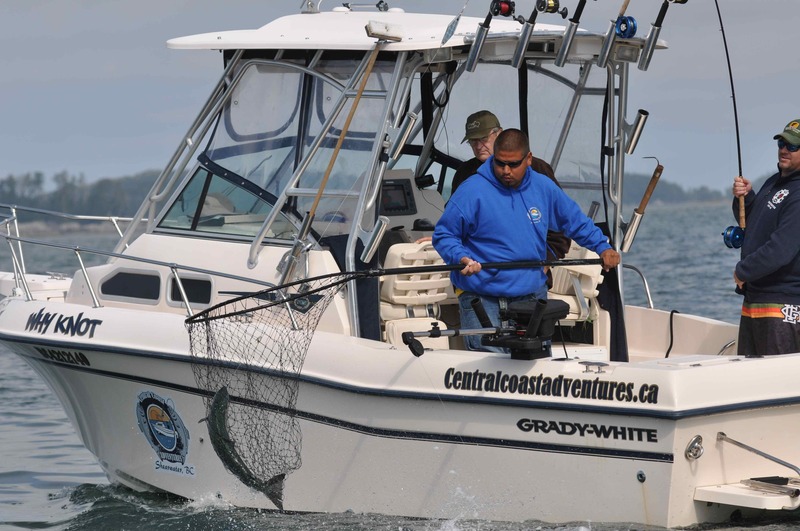 Another fine fish is netted aboard one of Central Coast Adventure’s fleet of Grady White sports fishers. Time and time again the fish surged off in sizzling line ripping runs, often the tip of a dorsal or tail fin slicing through the surface film. Frequently it changed direction and swam rapidly straight back towards the boat, forcing me to reel as fast as was physically possible to keep the line tight else the barbless hooks, mandatory for all salmon fishing in Canada, slip out. Several times I managed to bring that fish almost to within range of the net, but with a knowing grin Trevor sat back as yet again the powerful salmon surged off on another long run. That first chinook would have weighed perhaps 20lb, a solidly built bulldog of a fish and by the time we moved on a few hours later Doug, editor of American based Sport Fishing Magazine, and I had landed at least a dozen more, plus a similar number of coho, my biggest chinook weighing 28lb, not quite a ‘Tyee’. Looking west towards Goose Island the open sea outside of Hunters was a slick calm lifted by the gentlest of swells, perfect for halibut fishing, so that’s what we did next. 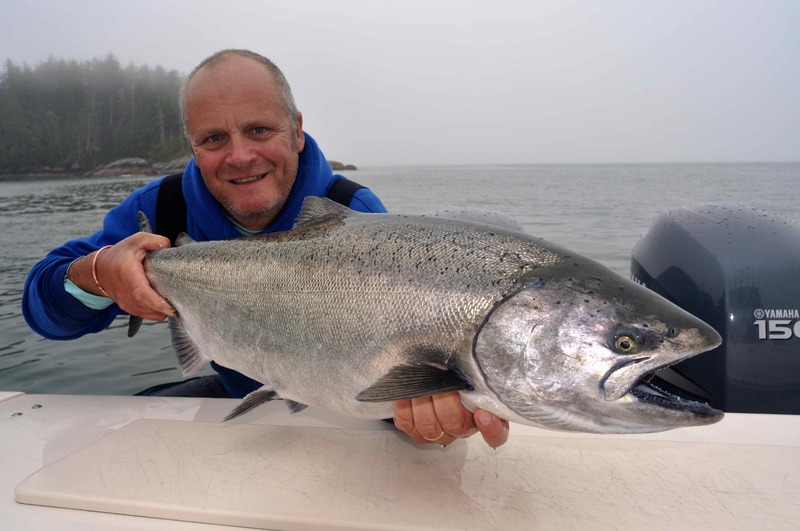 A stunning chinook for Doug. There’s not much I can say about the halibut fishing other than from what I experienced that day catching these muscular Pacific hyper-flatties up to 60-70lb is little more than a formality. Doug and I elected to fish lures, me a 385g Storm Wildeye Giant Jigging Shad, a firm favourite with Atlantic halibut in Norway. Trevor fished local style, salmon heads and filleted frames on a circle hook. Bites were instant, assuring seriously bent rods from the first drop. Doug got a 70lb slab on little more than a bass spinning outfit, sport fishing in the extreme. 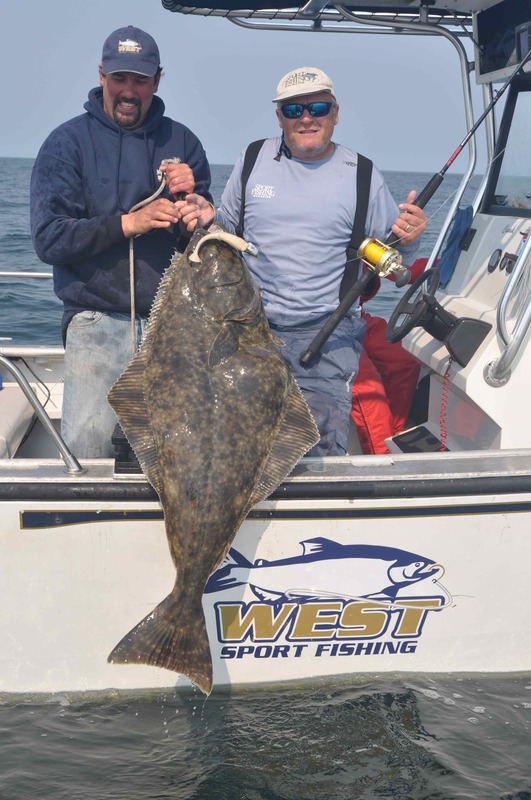 Doug & Trevor with a nice jig caught halibut. 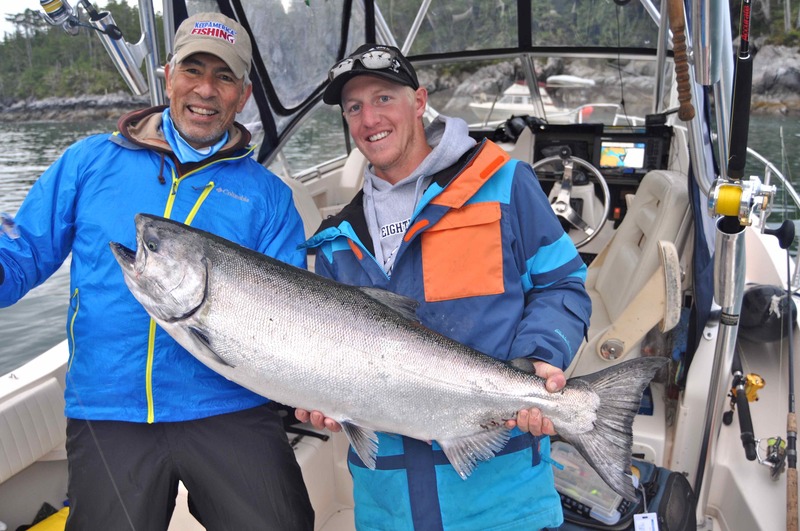 Doug & Trevor with yet another good chinook. One many highlights of this trip for me was when late one afternoon Trevor took me to fish off a river mouth for a couple of hours. When we arrived salmon were jumping everywhere, at times it was impossible to look across the water and not see at least three salmon, mostly bright silver coho, airborne. I fished a 65g red and white Williamson Yabai jig, and by the time we arrived back at Whiskey Cove Lodge in time for another excellent dinner I had caught and released six. The successful Williamson Yabi jig & Shimano spinning outfit. The next few days flew past in a blissful blur of bent rods and shining salmon. Once Trevor took us to a small reef where we dropped lures in the hope of introducing me to some of the plethora of different species of rock fish caught in the area. The action was fast and furious, but more on rock fish later, as all too soon I was checking out of the homely comfort of Whiskey Cove Lodge and waving goodbye to Trevor when he dropped us off at our base for the second half of the trip; King Pacific Lodge. 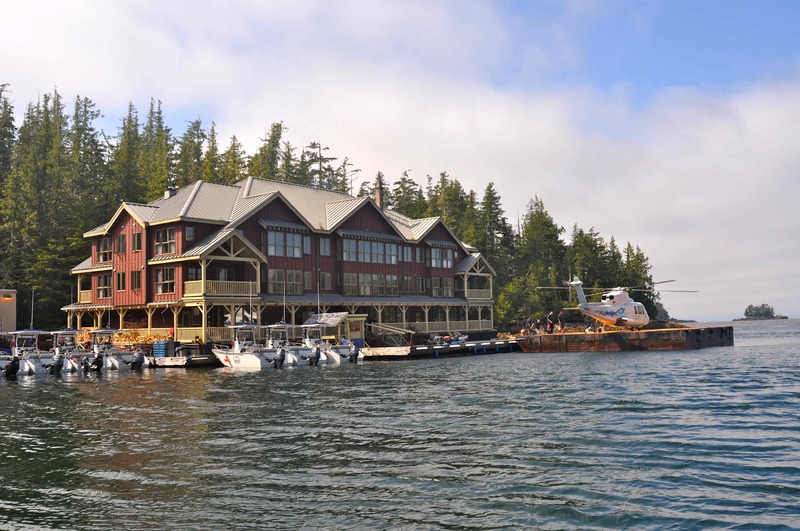 King Pacific Lodge, base for West Sport Fishing, can best be described as a sumptuous, 5-star floating sport fisherman’s paradise. 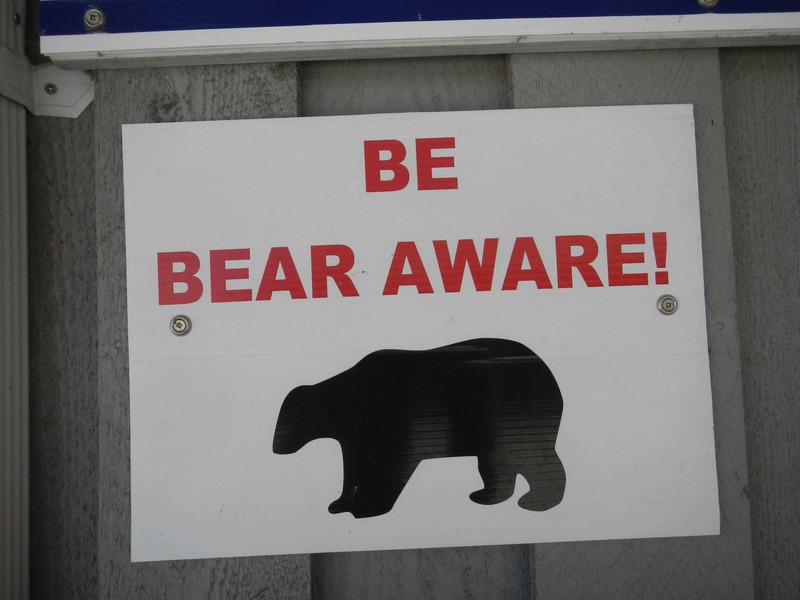 The facilities and standard of service and food are from my experience unsurpassed at many land based lodges, let alone one operating from a sheltered bay on the remote eastern side of Millbanke Sound. Guests are flown back and forth from Bella Bella via helicopter, and from the time they arrive until they time they leave their every need is catered for. 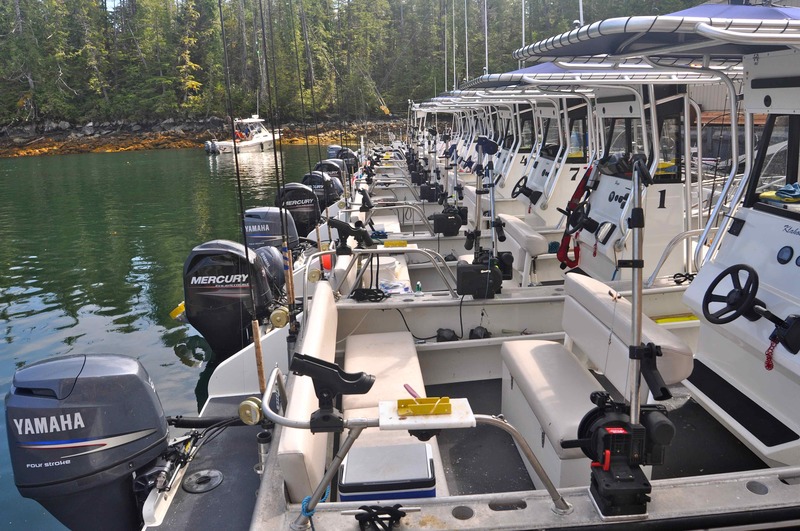 West Sport Fishing run a fleet of superbly equipped sport fishing boats, including all of the tackle you’ll need for your trip. All you need bring is a healthy appetite, trust me, you’ll need it! King Pacific Lodge; paradise afloat! Guests fish either with a guide or, as Doug and I did, on a self-drive basis. 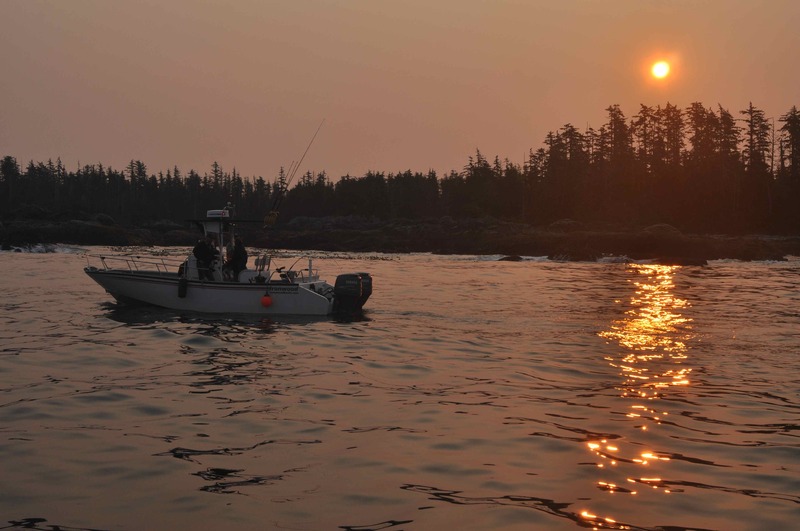 Cheney Point on the western shoreline of Athlone Island is the hotspot for salmon in Millbanke Sound, and barely five minutes after leaving the dock at King Pacific Lodge you’ll be lowering those first baits into clear water off Cheney in high anticipation of hooking a chinook or coho. Doug and I hit Cheney at first light the following morning, and it came as no surprise when minutes after starting to troll our ‘plug cut’ herring baits one of our bent rods suddenly snapped upright when a salmon hit the bait hard, instantly pulling the line free from the release clip. Fleet of sport fishers based at King Pacific Lode. 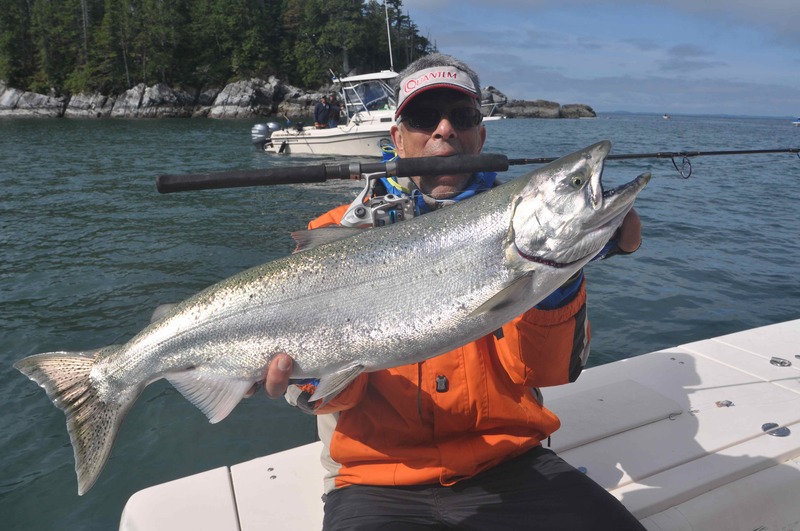 Normally when trolling natural baits for sport fish your primary objective is to make the bait ‘swim’ as naturally as possible to replicate a live baitfish; not so when fishing Pacific salmon. The head of a herring, the usual bait, is cut off at an angle, with the bait mounted to swim headless end first off a pennel rig. Trolling at around 2mph the bait constantly oscillates through the water, an action salmon find irresistible. Another great salmon, caught fishing with George Cuthbert. Salmon are clearly the number one draw in these waters, but as I have already eluded there are other fish to target. 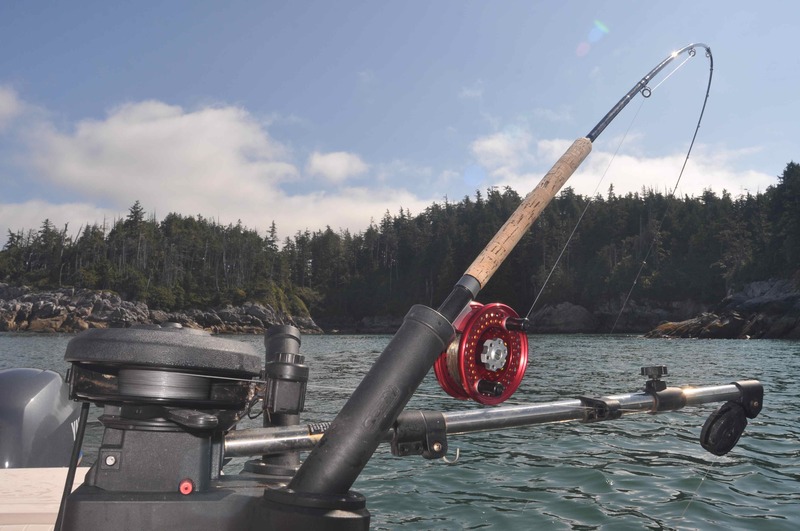 One day George Cuthbert, who runs West Sport Fishing, offered to take us fishing, and after spending the first hours of daylight salmon fishing, once again very successfully, we ran some 20-30 miles to fish a sandbank west of Day Island, passing a pod of killer whales en-route. Halibut were our target, and again catching these proved to be a formality, we got several to just under 60lb. 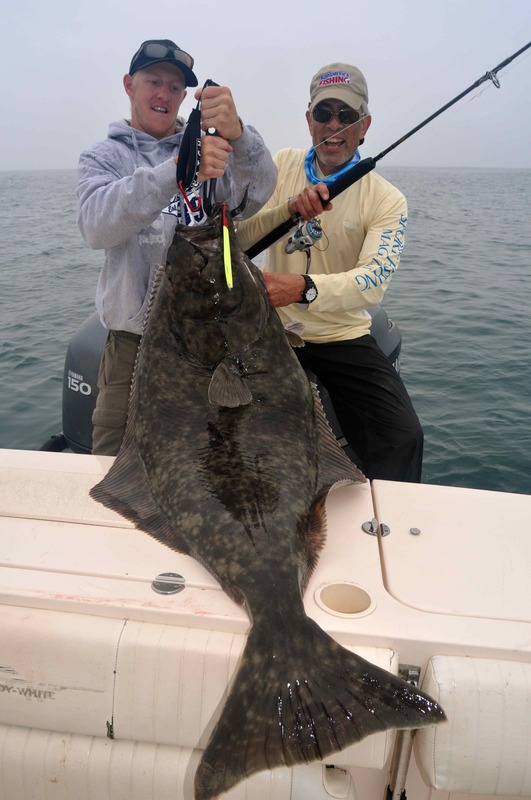 Another big halibut caught on a Storm jig. 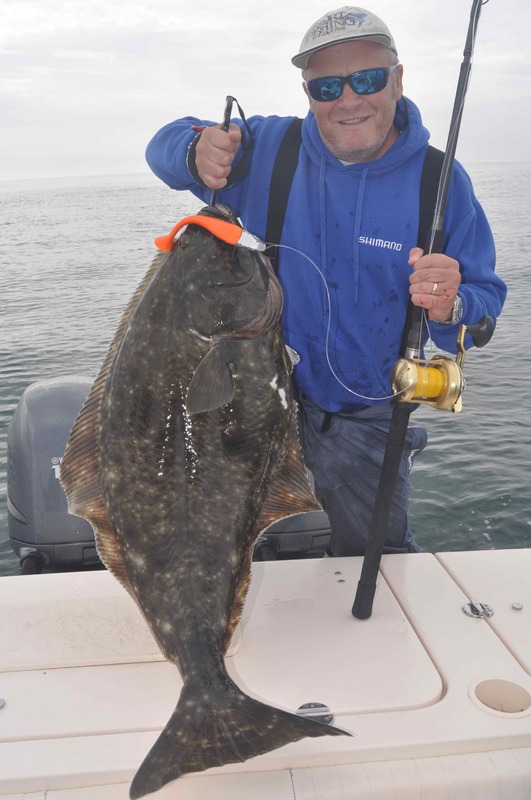 One of many halibut caught on Storm giant swim shads. George knew I was keen to fish for other species, so having quickly caught our fill of halibut we headed back to fish a jagged reef to the east of Day Island. 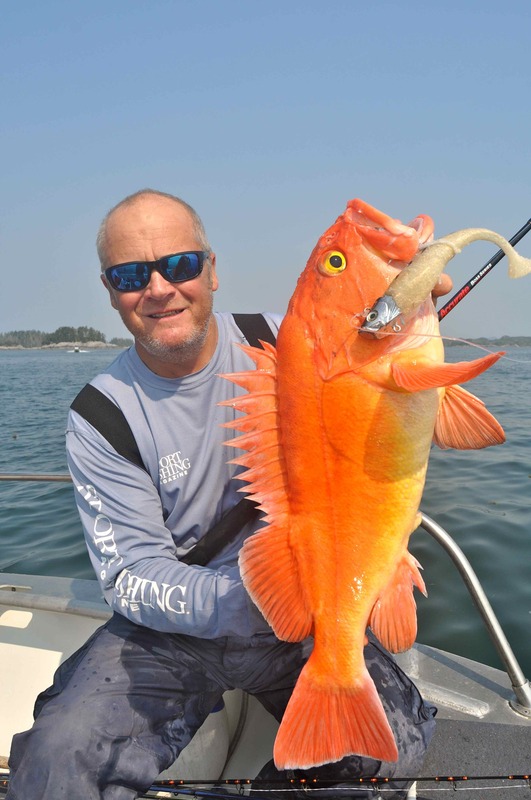 In the short time we fished before returning to the lodge for lunch we boated several voracious lingcod to 38lb, some chunky silver-grey rock fish and I got a stunning 11lb yellow-eyed rock fish. After lunch Doug suggested a run to fish some reefs south of Wurtele Island, where I dropped my 90g Shimano Bottom Ship jig over twenty times before it came back fishless. In total that afternoon I caught 9 different species of rock fish. Double figure yellow eye rock cod, again caught on a Storm giant swim shad. 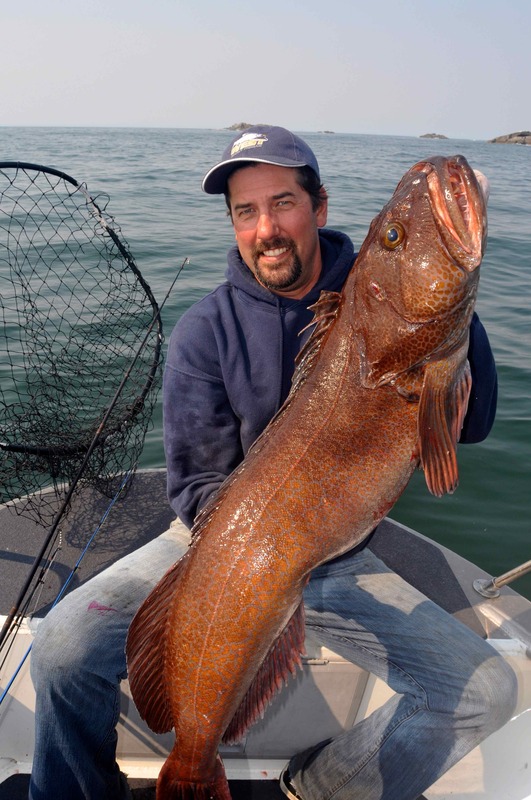 George with a near 40lb lingcod. All to soon it was our last morning, and Doug and I started at first light off Cheney. As we fully expected we didn’t have to wait long for a bite, and within minutes Doug was tight to what clearly was a very big, very powerful salmon. Playing that fish while I tried to keep us both away from the shoreline and other boats was tricky at first, but soon we were out in open, deep water and Doug could relax and enjoy the fight from his fish. As soon as I scooped it into the net I knew it was our biggest chinook of the trip, which the scales back at the dock confirmed. It weighed 30lb 8oz, a Tyee! 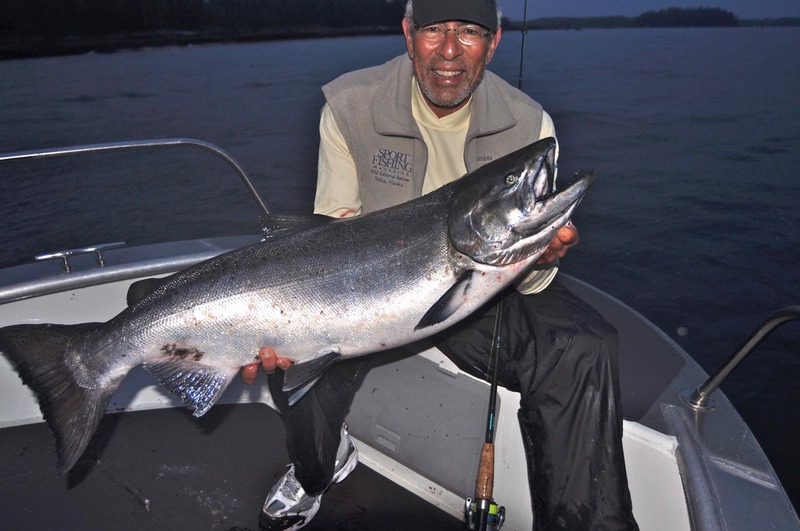 As delighted as Doug was at catching his trophy fish it was still a long way from his personal best chinook caught off British Columbia several years ago, a monstrous great salmon that weighed a jaw dropping 60lb! Doug’s last morning chinook, caught off Cheney Point. 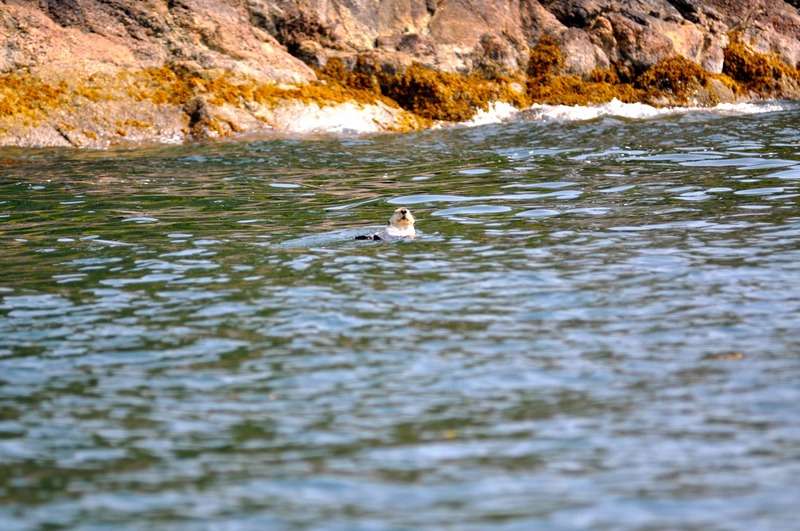 A sea otter keeps a close eye on us.